Life After Beth gets off to a strong start. From the trailer or even the awkward glare of Aubrey Plaza (Parks and the Recreation) on the poster that features the pun of a title there was a glimmer of hipster cool to this play on the zombie genre. Besides the casting of Plaza the inclusion of Mr. Indie himself at the moment, Dane DeHaan (The Amazing Spider-Man 2), speaks volumes to the kind of tone and atmosphere that first time writer/director Jeff Baena (who is Plaza's boyfriend) was attempting to capture in order to convey his attitude on this somewhat satirical, somewhat personal account. The sardonic aspects of the film are meant to function solely as a method of heightening the rather typical main narrative that follows the relationship of a boy and a girl and their break-up and how sometimes the saying "you don't know what you got till it's gone" is a bit of a false heading. I sound a little jaded though, I realize, which mainly comes from the fact that Life After Beth seems to believe it's both smarter and hipper than it actually is while almost counting on the public persona of its two leads as a way to convince audiences of both its intelligence and cool factor. In truth, the film feels oddly flat and struggles to collect any kind of coherent tone as the story goes off the rails early and is never able to find its way to anything resembling substance. Let's get back to that strong start though, because things certainly looked promising when the films score by the Black Rebels Motorcycle Club roared into play as the title card filled the screen and we are then taken into a small, often forgotten little moment that perfectly encapsulates the types of moments this film should be filled with. DeHaan's Zach Orfman stands in an aisle of a grocery store looking at the paper plates and napkins trying simply to find black napkins. He has been to a number of stores, that is clear, yet has failed to come across the only color napkin that might be suitable for a post-funeral gathering. When an uninformed employee suggests he try a party store as that color napkin is more of a seasonal item for Halloween we understand the confliction Zach is feeling and the dark humor in the observation. It is a moment we don't think of until we experience it ourselves or see it unfold in this fashion. We understand what is being reached for, but the remainder of the film fails to live up to these small, simple hopes I held after this gem of a moment. We only get a slight glimpse of Beth (Plaza) in regular form before the screen cuts to black and are then introduced to Zach. There seems nothing of certain significance surrounding Beth other than the fact she seems to be taking in some rather scenic views on a hike, but not really as she is preoccupied by her phone. The introduction of smooth jazz music is highlighted early and continues to be a point of reference throughout the film though I'm still fuzzy on if it had any deeper significance than I took note of. Zach is clearly crushed after the loss of girlfriend Beth in a freak accident that apparently happened on the hike we get a peak of in the beginning, but there is a weird sense of agitation around him. A lack of understanding it seems. His parents (Paul Reiser and Cheryl Hines) are sympathetic to the fact he just lost a girlfriend, but they don't seem to take the impact it might leave on a young, impressionable college sophomore very seriously. His older, but still living at home brother Kyle (Matthew Gray Gubler) isn't compassionate at all and is going nowhere as he exemplifies the oddness of the whole environment this movie exists within. Kyle is a security guard of some sort that patrols the gated community in which all of these events take place and all of the characters live where time has seemed to stand still while trends still pass and the outside world still turns. Zach hopes to somehow make up for the troubles he and Beth were having in their relationship before she died by getting closer to her parents (John C. Reilly and Molly Shannon). This seems to be proving an effective strategy until one day they stop returning his calls and answering the door. Naturally curious, Zach looks around the house only to see Beth walking around, perfectly normal, inside. The guy freaks out and understandably so, but it is from here that the movie never gets to a point or seems to have a clear line of thought, but instead just throws a bunch of theories at us hoping we decide to pick up the pieces. Zach (Dane DeHaan) attempts to console his back from the dead girlfriend (Aubrey Plaza). Once Beth returns and Zach gets past her parents it becomes clear Beth doesn't remember anything about her death or anything that has happened over the past week, but seems to be really nervous about an upcoming test more than anything else. At this point you may think that both Zach and Beth's parents would want to begin investigating the possibilities as to why their daughter and girlfriend might suddenly have risen from the dead, but instead they intend on keeping her locked in the house as long as they possibly can without taking the risk of possibly losing her again. This is understandable, but it doesn't leave the movie much of anywhere to go besides Zach trying to bust Beth out of her parents suburban prison for his own selfish reasons. The main detractor here though is that we don't much care for Zach as a person. He mopes and we know why, but he isn't all that interesting on his own. He and his brother have this somewhat Napoleon Dynamite/Hot Rod friendship that never feels as funny as it should and he attempts to talk in philosophical terms that come off more cliché than anything else. Then there is his need to constantly push himself on Beth's parents in order to better understand the situation which ends up feeling irritating because he clearly has the intelligence and the means to investigate and draw his own conclusions. I feel I know what Baena was trying to accomplish though in giving us a different or at least fresh perspective in the event of the zombie apocalypse, it just doesn't breathe like it should. Ultimately, that is what is at stake here and instead of being the sheriff or the scientist that plays a more integral role in the night of the living dead we are given the perspective of someone in a very specific situation who takes these events of genre movies to mean more than is actually occurring. Zach interprets Beth coming back to life as a sign, a second chance that allows the movie to explore avenues of emotions and relationships we can all relate to. So, what we're really looking at is a George A. Romero movie made through the eyes of Nick Cassavetes. Sounds interesting, right? It is. That's the worst part of it all. The premise and the set-up are beyond intriguing and more than a fun idea to play with, but the script that evolved out of that idea and now sits in front of us for our entertainment doesn't live up to not only the hopes we had going in, but what I can't imagine Baena saw for this project. In reality it comes off as nothing more than another austere indie flick. The ending comes as too easy an out and Anna Kendrick's character is shoe-horned into the plot in such a way that serves to both address the fact there is always something new and undiscovered on the horizon for the relationship angle so that we don't think the end of one relationship is also the end of the world (see what they did there). Where she falls into play in the whole zombie apocalypse deal though seems to be to only cause Beth to turn more towards her zombie tendencies (which are rather similar to that of a jealous ex coincidentally), but because it occurs so late in the film we never feel any tension in the proposed triangle. 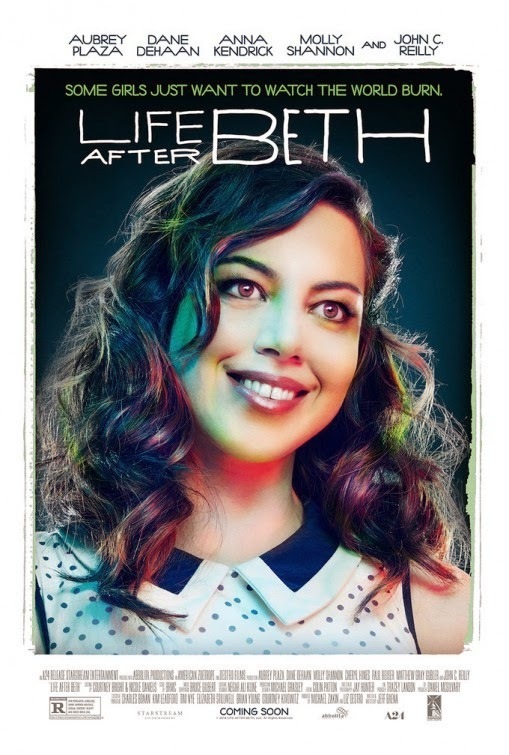 Life After Beth seems to be intended as a comedy and to that effect it doesn't deliver as much as it should especially with the immense cast of comic talent it has on board while the horror elements of zombie movies are only here to serve as a fantastical element to add something new to the story rather than going by any of the tropes that typically come with the genre. This opportunity for Zach to reexamine his relationship with Beth makes for a few amusing scenes that convey the highs and lows everyone goes through in a relationship while immediately allowing for the character to understand what it truly means to take things for granted. This is all to such a severe level that it serves the situational comedy well and there is surely insight for teens and young adults in the way Zach comes to realize their love and Beth weren't what he thought they were, but unfortunately the film as a whole can't overcome being average even with its catchy hook.